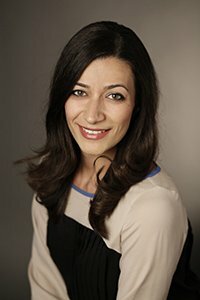 Artineh Samkian is an Associate Professor of Clinical Education at the USC Rossier School of Education. Samkian’s expertise and interests are in qualitative methods, evaluation,Armenian immigrant acculturation in the United States, race/ethnicity studies, and students’ affiliation to school. Her professional research experience has spanned both pre-K-12 and higher education contexts, and her professional focus and interest has been in utilizing rigorous methods and research evidence to inform and improve educational practice. Samkian worked for the Los Angeles Unified School District as Educational Research Analyst for the Research and Planning Department (formerly the Program Evaluation and Research Branch). Among other projects, she served as the Project Director of a study on the professional development provided to district leaders. The study was designed to provide formative feedback to key stakeholders in the District, thus informing the design and implementation of the professional development. Most recently, Samkian worked as a Research Analyst at First 5 LA, an organization that funds health, safety, and early education programs for children prenatal to age 5. Among other projects, she served as the Project Manager for the Universal Preschool Child Outcomes Study (UPCOS), which examined child progress from fall to spring for 4 year-olds enrolled in Los Angeles Universal Preschool (LAUP) programs. Prior to coming to Rossier, Samkian was an Adjunct Professor at various universities including Claremont Graduate University and UCLA and was a sixth grade teacher in ELL and math in the Los Angeles Unified School District. She holds a BA in Anthropology from Occidental College and an MA and PhD in Social Research Methodology from the UCLA Graduate School of Education and Information Studies.